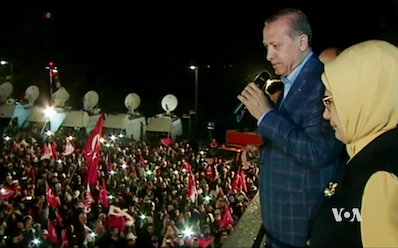 Turkish President Recep Tayyip Erdogan claims victory in the April 16 referendum at a rally on the night of the vote. In a bitter irony, nearly 55 million Turks went to the ballot box on April 16 to exercise their basic democratic right to vote. But they voted in favor of giving away their democracy. The system for which they voted looks more like a Middle Eastern sultanate than democracy in the West. The changes make Erdogan head of government, head of state and head of the ruling party -- all at the same time. He now has the power to appoint cabinet ministers without requiring a confidence vote from parliament, propose budgets and appoint more than half the members of the nation's highest judicial body. In addition, he has the power to dissolve parliament, impose states of emergency and issue decrees. 1. Erdogan's confrontational Islamist-nationalist rhetoric keeps appealing to masses who adore him for his claims of being in the process of restoring the country's historical Ottoman influence as a leader of the Islamic world. His rhetoric -- and practices -- would often echo an authoritarian rule in the form of a sultan. It was not a coincidence that the thousands of Erdogan fans who gathered to salute their leader after his referendum victory were passionately waving Turkish and Ottoman flags and chanting "Allah-u akbar" ["Allah is the greatest", in Arabic]. For most of Erdogan's conservative fans, "God comes first... then comes Erdogan." That sentiment explains why the vote on April 16 was not just a boring constitutional matter for many Turks: It was about endorsing an ambitious man who promises to revive a glorious past. 2. The 'No' campaign and its supporters were systematically silenced and intimidated by a powerful state apparatus, including its police and judicial powers. In contrast, the 'Yes' campaign enjoyed all possible government support, with full mobilization of state means and public resources. Worse, Turkey went to the ballot box under a state of emergency that was declared after a failed coup in July. 3. A European Union (EU) parliamentary organization warned before the referendum that the democratic legitimacy of the vote was in question. 'The conditions for a free and fair plebiscite ... simply do not hold,' said the EU Turkey Civic Commission. It mentioned that the lawmakers' ability to campaign for the 'No' vote had been undermined by the government. "The conditions for a free and fair plebiscite on proposed constitutional reforms simply do not hold," said a report released by the EU Turkey Civic Commission. The report highlighted, among several other reasons, that the co-leaders of a pro-Kurdish political party who campaigned for 'No' have been imprisoned since November on charges of links with terror groups. In the 15 months leading up to the referendum, says a civil rights NGO, police used violence to stop a total of 264 peaceful demonstrations in support of the 'No' campaign. 5. The main opposition Republican People's Party claimed election rigging. It claimed the vote was manipulated in terms of content and method. Only an hour into the vote count, the Supreme Board of Elections declared as valid voting papers without official seals. That practice is clearly in violation of the election laws. The opposition also claimed that in some cities the election observers from the 'No' groups were removed from their polling stations. In Turkey, it probably does not matter what is in the ballot box; what matters more is who counts them. By a narrow and controversial margin, Turks have voted to establish a sultanate. The April 16 vote in Turkey meant more than a simple vote on a package of 18 constitutional amendments. With a narrow and controversial margin, the Turks voted to change regime in favor of a sultanate. It was not a coincidence that a news editor for Yeni Akit, a militantly Islamist newspaper and a pro-Erdogan outlet, tweeted after the referendum results, an obituary for the "Old Turkey." In January, a columnist for Yeni Akit claimed that Erdogan would become the "caliph" if he wins the referendum and the presidential election. Turkey's soul-searching and societal wars never have a moment of truce. Turkey's wars are not just between political leaders and parties; they are wars between the supporters of a democratic, secular country and those of a caliphate which Ataturk, founder of modern Turkey, abolished almost a century ago. As Kati Piri, the European Parliament's Turkey rapporteur, said of the referendum: "This is a sad day for all democrats in Turkey."